It’s hard to believe we’re officially on our last stretch of this big RV road trip to and from Alaska. Seeing the Northern Lights was our last big bucket list item. It was that last big check mark on our mental list and knowing we’re starting the trek towards the lower 48 that has us at a literal and proverbial crossroads. The literal crossroads – We left Harding Lake, arrived in Haines Junction and we have two route options. 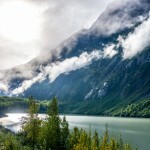 Spend several extra dollars and days to make the trip to Haines and Skagway, AK. Save some time and money by taking the direct route through Whitehorse, YK. The proverbial crossroads – We’ve taken in so much over the last several months, documented more than we ever have and traveled/adventured at a more vigorous pace than ever. So…we’d be lying if we said we weren’t getting weary. On top of that, we have a big job (because we still work beyond our Gone With The Wynns stuff) in less than a month that we have to be back and ready for. We have to decide how we want this last stretch to go. Take our time getting back to the lower 48, take the side trips, squeeze in those last few adventures and we’ll sleep when we’re dead. Hustle back to the lower 48, take the time to decompress from the Alaska high, get caught up on work, be well rested and prepare for our big job. 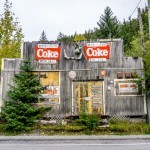 It was here at the intersection of the Alaska Highway, the only road to the isolated town of Haines, standing in front of the “Muffin” that we had to make the big decision. As you can see in the video, we decided to take the direct route and save some adventures for our next big Alaska trip (because there’s no doubt we’ll have another). Arriving in Stewart and preparing to cross the border into Hyder, we didn’t expect much. We knew most everything would be closed and the famous bear viewing would be vacant. We were crossing back into Alaska simply for the sake of saying a proper goodbye. We wanted to check it off the list and see what was still left wandering around other than a couple of travel weary sedentary lifeaphobics. It was one of those towns that had raw character and charm beyond the tourist attractions. It felt warm and filled with stories from times past. We were sad we didn’t catch it a little earlier in the season but glad we experienced it none-the-less. 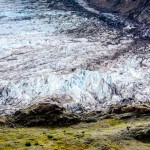 The big surprise in Hyder, and the biggest wow factor for us, is the journey to Salmon Glacier. There’s something about this quirky 16 mile stretch of road that goes from Stewart, British Colombia to Hyder, Alaska and back into Canada. Its a bumpy dirt road up the side of a mountain that had us feeling like authentic globe trekkers. Then of course we arrive and there it is, in all its rugged glory. It’s a massive river of ice like we’ve never seen before and it literally takes our breath away. The proud travelers who have now seen glaciers from a helicopter, hiked on, climbed into and paddled up to…are yet again frozen in complete awe. 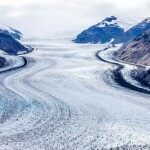 I guess this just goes to prove once you’ve seen one glacier, you’ll want to see them all. 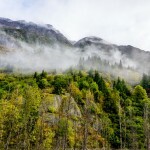 The Cassiar Highway is a stunning drive and has a feeling of wilderness that trumps the more populated ALCAN Highway. There’s plenty of great Provencal Parks and Wild Camping along the way but the real gem of this drive is after you turn west on Highway 37A, near mile marker 97. If we would have had more time, weren’t trying to beat the pending winter weather, and didn’t have a pending job we would have easily spent a month exploring this route to the fullest. We’ve got about 100 miles of the Cassiar left, along with the road to Vancouver and our final crossing back into the lower 48. 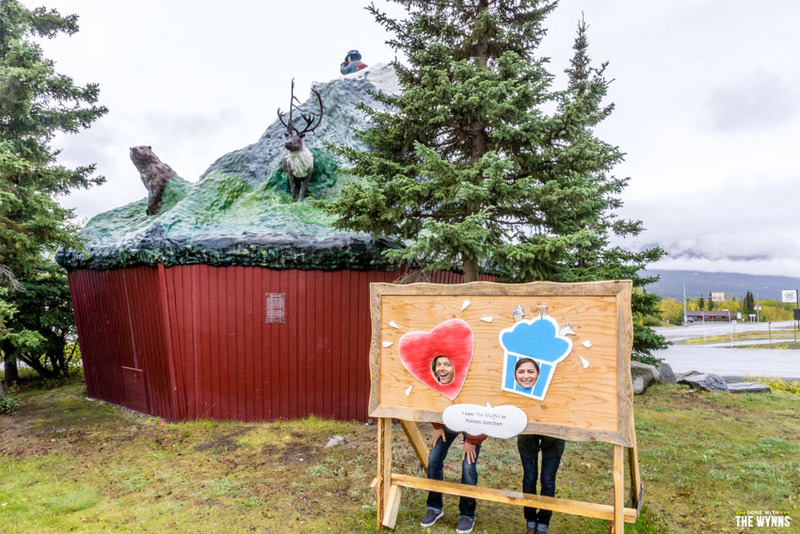 The adventure isn’t over yet but we can’t help but feel a little bittersweet knowing that we’ve left Alaska for good. We hold back the tears crossing into Steweart, BC and give Alaska one last wave goodbye…Thanks for the unbelievable summer! 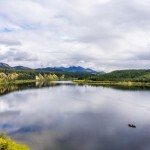 Have you traveled the Cassiar? What was your favorite stop? How did the roads treat you? Did you take it on the way North to Alaska or south like us? Please share in the comments, we’re dying for a little more Alaska nostalgia right about now. Fuel Prices – Fuel is cheapest in Alaska. In Canada fuel is slightly cheaper in the Yukon than in BC. We fueled up in Whitehorse at $1.199 per liter before heading down the Cassiar Highway. 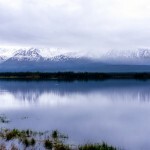 Weather – Winter is slowly beginning to settle in up here and rain has become common. Highs were around 60°F and lows dipped around 30°F. We’re trying to find that camping site you mentioned and gave the coordinates for but the coordinates don’t work in Google maps. Is there something missing from the coordinates? 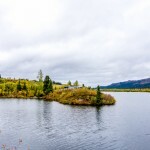 I love the Cassiar Highway, we have been to Alaska twice, but I had the privilege of actually working in Tahltan Territory and staying Dease Lake for 3 summers, so got to explore the area extensively. A side trip to Telegraph Creek and Glenora is definitely on my must do list for that area, I must have driven out that way 50 times over the three years and never tired of the scenery and the people. I really think if you are driving to Alaska and don’t take the Cassiar Highway in at least one direction you have missed the crown jewel of the trip. But it is a long way from Telegraph Creek to French Polynesia so I will have to catch up with you later, safe seas, and fair winds. Yes…as I mentioned in another post, we also did the Yukon/Alaska trip this past summer (2015) in August, where we went north from Vancouver, and up the Alaska Highway, stopping at the odd museum along the way (Fort Nelson one was great), one or two of the ‘Best Cinnamon Buns in the North’ at specific locations along the way, all the way to Whitehorse, then further north to Dawson City! Not sure Jason/Nikki if you when this route, as ‘Diamond Tooth Gerties’ was an awesome stop along the way. Then over to the town of ‘Chicken’ and beyond, where we saw hundreds of wild Caribou passing by on their migration! 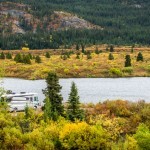 The roads where amazingly fine for RV’s, and the wildlife was truly a treasure up in this wilderness region of the Yukon. Eventually you come to the entry point into Alaska, where if you have any fruit, it needs to be discarded. 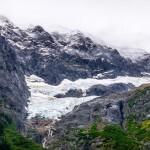 I wanted to mention, upon our return trip…we decided to drive down to Skagway where we stayed the night at an RV park right on the ocean, where we could walk into town for a wonderful meal that night. The next morning we got on the ferry to Skagway (what a gorgeous town!) where we spent the day checking out the many gift stores, and some of the unique individuals walking about. The drive out of Skagway was one of awe, where we felt like we where somewhere in Switzerland, as the beauty of the mountains, lakes and streams where truly breathtaking. Further down, we too drove south along the Cassiar highway, where we stopped in Stewart, then into Hyder and up to the Salmon Glacier. Unfortunately, the Glacier was completely socked in with fog when we arrived, so we had about an hour of waiting for the Glacier to appear, and yes, it was worth the wait. 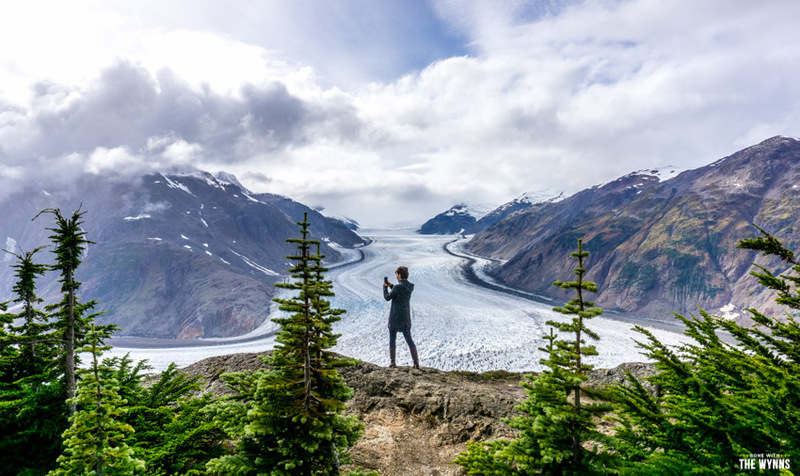 While there, their was a fellow selling CD’s of both the Grizzly bear watching (bottom of the hill near Hyder) as well as his many hikes around Salmon Glacier, one even being beneath the ice itself. The many bird species in the area, and of course the story of the salmon that the bears come out to feed on. We stopped at a few of the Indigenous native towns south of Stewart, and saw many of the totem poles erected in their communities, and a bit of a history lesson on their heritage. Little was said (and perhaps you didn’t know Jason) where from when you leave the Cassiar highway, to head west on highway 16, regrettably ‘Highway 16’ is now called the ‘Highway of Tears’, as 18 Aboriginal women have been murdered along this stretch of highway since 1989 to 2006. One can google (highway 16 – highway of tears for more info) as there is currently a Federal public inquiry to the death of these women after all these years. We saw a billboard about avoiding hitchhiking, but we didn’t have time to investigate. Thanks for sharing. From the Netherlands (Europe): we love your video’s: many compliments! And we love your country (Alaska, Montana, Wyoming, buts also Highway 1, Arizona, New Mexico, and so on). We drove the Cassiar (and the Alcan) more then a dozen times with….. American Muscle Cars (cabriolets). Drove around every year for months. Love the wildlife, you really missed some things in Haines. See our video’s at http://www.youtube.com/tinekemike. We will be back every year!! Thanks for sharing the ride through that beautiful, awesome part of the World!! 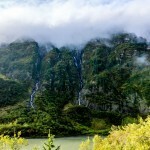 Great video – I liked the upper mountain scenes where you were in the clouds and you could see the clouds floating by!! We’ve just signed up for your newsletter. Notice you love high tea. The wife drinks hot tea all day! We highly recommend you check out The Republic of Tea website for ordering loose or bagged teas. We are not affiliated, but purchase from them every flavor you can image. Enjoy! Another informative post. Glad you took the time (and had decent weather) to see the Salmon glacier. The video states taking a ferry ride from Skagway or Haines. 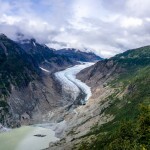 taking the RV and smart tow car from Skagway to further South? The Alaska Marine Highway would charge your rate by the foot. We were headed south in Alaska after a month and a half, got on the Cassiar Hwy. on August 2, 2005. Your video shows a lot more pavement than we remember, and we had rain at times. At a fuel stop a highway construction worker said they were in the process of getting the entire highway paved. By the time we drove through Stewart BC and crossed into Hyder AK on August 4 our dark green dinghy and the lower half of the MH were solid brown with mud. A fellow had an RV wash set up along the road: a very large water-filled iron kettle over a wood fire and a pressure washer, with a rental truck for storage — and we paid $45 to get clean. Hyder – what an eclectic place. We did get to see bears at the NFS viewing area, but, unfortunately didn’t make the drive to Salmon Glacier — your video is great! We enjoyed meals at The Bus and Wild Flour. The rough stone road through town was graded the day before we left by the mayor using his own grader. I enjoy following you along your RV travels. I have lived in Alaska since 1980 and have to tell you—you missed the most gorgeous drive of all when you decided not to travel the Haines highway to Haines. Granted, you do have to take the ferry to Skagway, but it saves you an entire day of driving through Whitehorse and is relatively inexpensive for the short 13 mile trip via water. 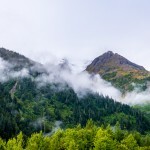 The Haines highway is the most beautiful drive in most of Alaska. You also miss seeing the Chilkat Bald Eagle Preserve, site of up to 4,000 bald eagles each fall. 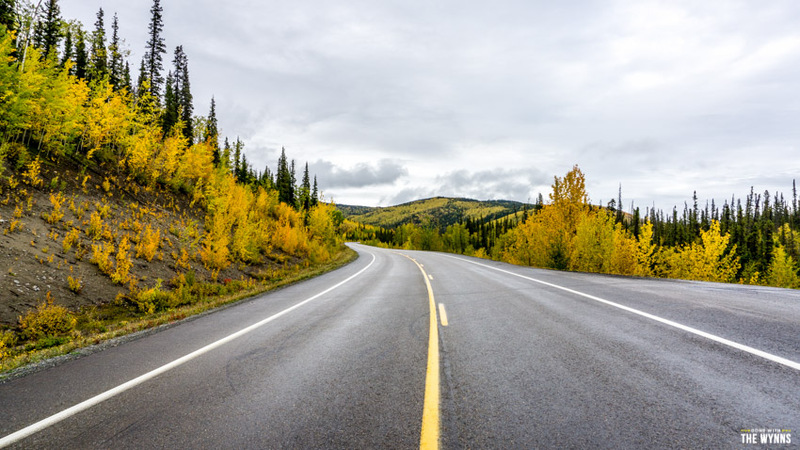 The Cassiar is also a great drive, just not as beautiful as the Haines highway. Hope you have a great and safe 2016. We met you on the Glenn Hwy on the way to Anchorage. It was our first RV trip to Alaska too and we had a blast despite Dianne breaking her leg at Bird Creek Campground. On your way down the Cassair, did you notice the mushroom pickers? We stopped in Kitwanga and met First Nation people who foraged Matsutake Mushrooms which they sold to brokers who shipped to Japan. It was a pretty big deal and the mushrooms were delicious. I’d like to share a couple picks. Also, did you stop at Deadman Lake? It is a free campground in the Tetlin NWR. 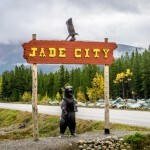 Loved the video of the Cassiar, we unfortunately did not to spend as much time along there and only made an overnight stop at Jade city. We came through there in Mid July and the first 100 miles were horrible road conditions but we did get to see lots of wildlife having to take it slow. 🙂 You guys have done such a great job of documenting your visit it makes it easy to go back and relive many of the places we were and didn’t take video. Thanks for sharing. You guys are awesome! I will be following you on your sailing adventure, that should be interesting. Good luck! I lived in Alaska for 30 years and have driven the Cassiar over a dozen times. It remains one of my favorite drives. There are so many places to pull over for the night, that I have tended to bypass the provincial parks, however Kinaskan Lake PP is lovely. Next time you are in Hyder, check the garbage dump, as it was one of the best bear viewing sites I found. Thanks so much for sharing that awesome trip. Learned so very much, going to use it as a great reference and just really makes you want to visit Alaska even more. Glad you had a great trip. After being bandwidth-poor for a considerable stretch, followed by immersion in holiday family-visiting, we’re finally binge-watching all of your latest videos to catch up. Your Alaska series has been inspiration and reference library rolled into one. Absolutely required reading & viewing for anyone considering the trip. And of course we now what gear to use to capture all the images. Thank you both for the incredible contributions you make to the RV community. The vast effort you put into your presentations really shows. Awe, thanks for binge watching (you must be somewhere with unlimited data) and for the love, you guys certainly know how much work it is to create videos. 🙂 You guys are far too close to Alaska not to make the trip someday. Who knows, maybe we will join you! over a very ROUGH ocean crossing which would rock your RV. Thanks for taking us along on your Alaska trip. Your big rv must hold about a thousand people. I learned a lot and enjoyed all the pictures and video. Yall really scared me on the glaciers. I know a return trip will be made. 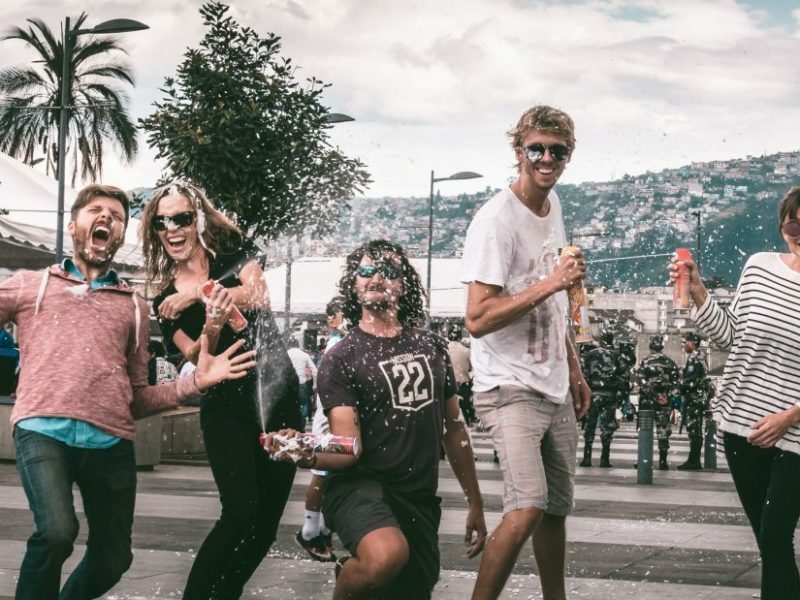 My experience is that the first trip is the most fun because of the new and unexpected. I’m 70 now and feel like I’ve been to Alaska because of you two. Thanks again. Owning a travel trailer and on the verge of retirement I never even considered a trip to AK until I saw your pictures and videos. Alaska is awe inspiring and I thank you for sharing that with all who follow you. What I am disappointed in is that you will be giving up your coach and hitting the waters on a sail boat. I saw your interview and what I do not understand is WHY. Be safe and thank you so much for inviting me into your home on wheels. We really loved the trip to Alaska and haven’t met anyone yet who wouldn’t do it again. It’s really that grand. As for the desire to sail…well that has it’s own video coming someday soon. 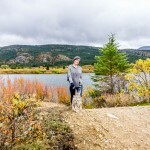 We loved the Cassiar in the Fall too. Since you plan to return to Alaska, it was wise not to rush through Skagway and Haines. Both towns and the drive(s) deserve a good amount of time. Skagway is very touristy, but interesting, especially if you get a bit off the beaten track. Save time for the historic train ride. When you get off the ferry in Haines, turn right away from town for an amazing lakeside campground and beautiful river. I have never seen fall color like I did on the Cassiar! We had so many people tell us how wonderful the drive, Skagway and Haines were that we knew we wouldn’t do it justice by rushing. I am glad to hear you agree with that. The Cassier was one of our favorite roads on our way to AK this summer so when we reached that Crossroads on our way back down we decided to take it again, I love the remoteness and the rugged wilderness. The views are spectacular and you can watch the terrain change from alpine to almost tropical and then to farm land. We visited Stewart and Hyder as a day trip (we camped at Meziadin Provencal Park) in June. Saw dozens of Bald Eagles…many of whom were helping their young learn acrobatics! 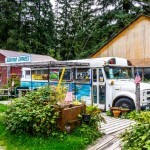 We ate at The Bus…a quirky old bus converted into the absolute best halibut restaurant. Fish and chips!! They are opening a coffee shop too in a reclaimed “tiny house” structure right next door. Such a unique area. Awe, so glad to hear you loved the route that much! However, now I am really sad the bus was closed when we were there! We saw bears all through Canada too and only a couple in all of Alaska. Crazy how that happens. James, sounds like you are due for another dose of Alaska yourself. 🙂 Thanks so much for being a part of the journey with us! this summer was a moterhome. But speaking of broken parts though… we did start slowly loosing the use of our jacks the first one going in Soldotna then one by one going. When we got to Homer we went to the local lumber yard and had boards cut to level with. We take the Cassiar home as we too love to visit Stewart/Hyder. We were there in mid August…no bears…we heard there were too many salmon elsewhere for them to visit the river at the boardwalk. 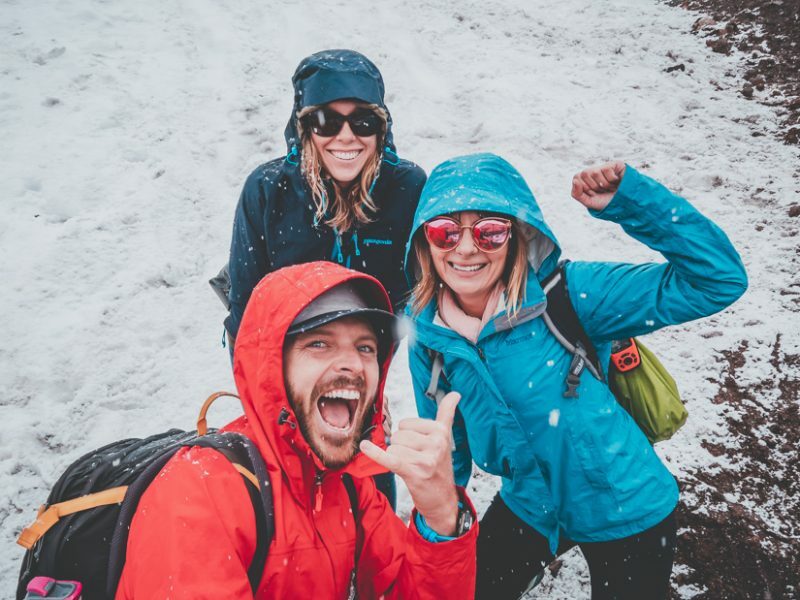 We have come to a conclusion about Alaska…there are some of us that when we visit Alaska we become infected with the place. Oh yes, we have the Alaska bug!  We loved it and I love hearing that you have had 3 trips now! Funny how some trips you come away unscathed and others everything seems to break. Thank you Jason and Nikki, Your travels on your Alaska trip have been amazing. You have certainly inspired us to take that trip someday and see the beauty firsthand ourselves. 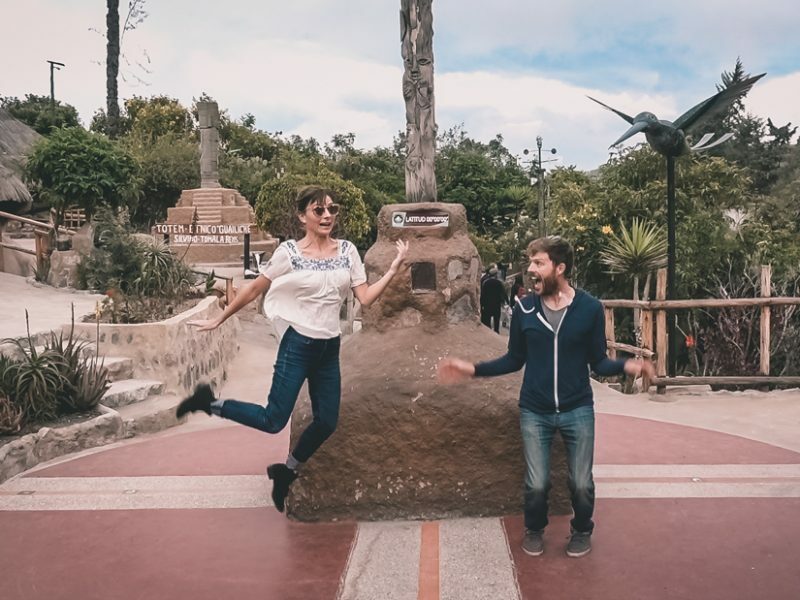 You two do such an amazing job of documenting your travels that we all feel like we have joined you for your journey. Best of luck in the future. Thanks Rick! We have really enjoyed sharing it all and its all the more exciting knowing that others are making plans to check it out themselves. Plus, we are really loving all the stories from people that visited long ago before the roads were really taken care of. It’s amazing how much more accessible things become with time. It was kind of sad to see the end of this trip. Some of us lived to see where you all would be next and what you would be up to. 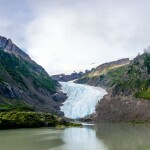 Will you share your favorite glacier, town and your favorite hike? Not sure when I will have months to spend there. I do plan to go back again and check out some of the places I have not explored. It was a lot of fun watching you!!! Thanks so much for watching! It’s the end of one adventure and the begging of another.  We do plan to create a wrap up video/post including highlights, tips and our fave gear. So happy you got to experience the Cassiar and Hyder. There is something very magic about this area and when Dennis and I traveled down there on our way home we were equally as captivated by the area. Like you guys we were on our way home and had a deadline or I think I could have spent a week in Hyder. We were fortunate to come through at the end of July and the salmon were running. It poured rain while we were there, but it didn’t “dampen” the trip at all. We saw bear, up close, about 6 feet from the car! I fell in love with Hyder and Stewart. There’s a little bakery/restaurant where your autograph the wall and the locals hang out in there in Stewart. We stopped in for breakfast and caught up in all the town gossip and visited with some wonderful folks. I don’t know if we’ll ever get that way again, but Stewart and Hyder will have a very special place in my heart. If I could talk my hubby into it, I’d go again next summer, but alas, he says no, so I guess we’ll be northeast bound next summer. Thanks for sharing your adventures and I can’t wait to read about your new ones! Oh yeah, Skagway is cute, but very touristy. 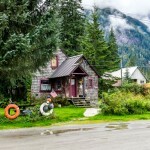 The best part about our Skagway stop was driving over to Dyea and exploring the old town site, of the things to pass on and things to not pass on, you made the right choice. I have never been to that area of AK, so thanks for sharing it with us. Your last view says Alaska as well as any. The road, the trail, the weather, the glacier, the river, the wildlife, and the awesome view. I hear the sadness in your voices and see it on your faces on leaving Alaska. I understand the feeling. You can leave Alaska, but Alaska will NEVER leave you. Wow….What a trip….Just the amount of wild camping….you two shared with the rest of the RVer out here. I still remember Jason’s “double rainbow …double rainbow” spot….I was also planning to do the Cassier on our trip back down at about the same time later this year. Didn’t realize things might be closed up. After your snow event inside Denali (Aug. 22 +or-), we will be placing a careful ear to the weather forecast for returning after Labor Day. At least that is the plan. Sis-n-law in North Pole said they had snow Labor Day weekend. Early for them…but still something to watch. ? When you found a spot to pull off such as a plain old “pull-off” or like the spot at Upper Gnat Lake, were there signs saying “no over night camping / parking” and people were parking anyway. I pulled so many notes from your travels to AK. looking forward to you sailing adventures. Cat or Mono? been following SV Delos (YouTube sea travelers) to warm me up to the logistics of sailing. All I can say is EEEK’s…I’ll stick with my two inflatable kayaks. Once again thanx for all the years motoring / exploring / Rving around the country. After watching the video, I realized how noisy/squeaky the RV is. Kinda surprising considering it’s age and cost. Btw I love that picture you have for the video. Sooooo pretty. 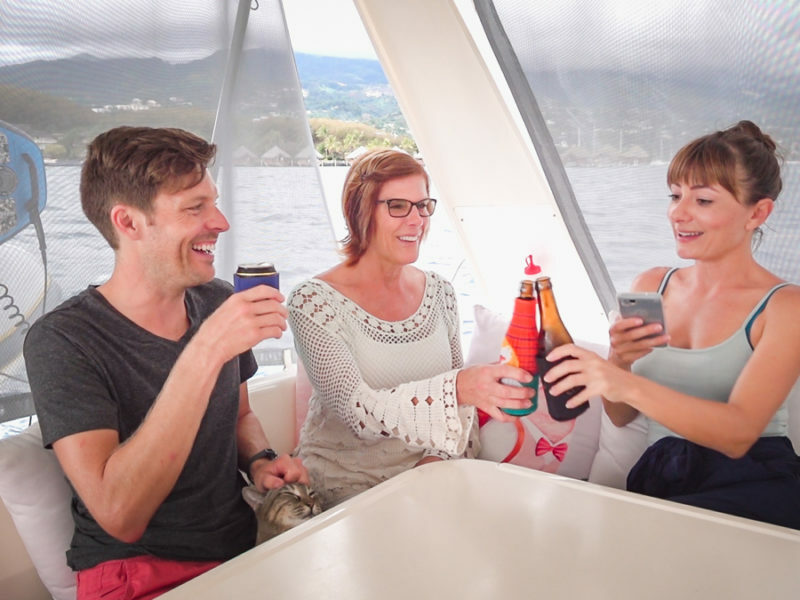 Jenn, I can only imagine all the memories you created with the family on your trip! Now that you have another little one on the way, you will no doubt have to make another trip!